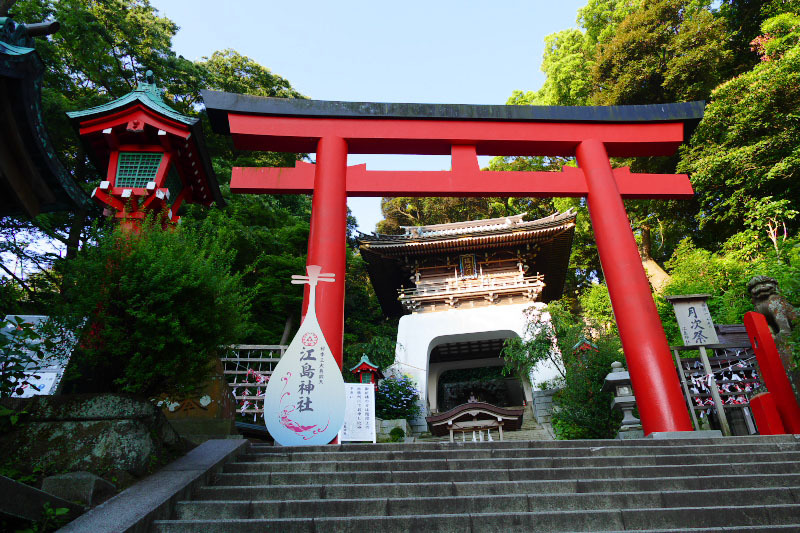 There a lot of tourist attractions and activities in Enoshima Island and Kamakura. So, we'd like to advice you recommended activities and attractions that you don't miss while travelling this area. And there is some act that you should avoid, to enjoy your travel. Please read this and make your travel much more fun! 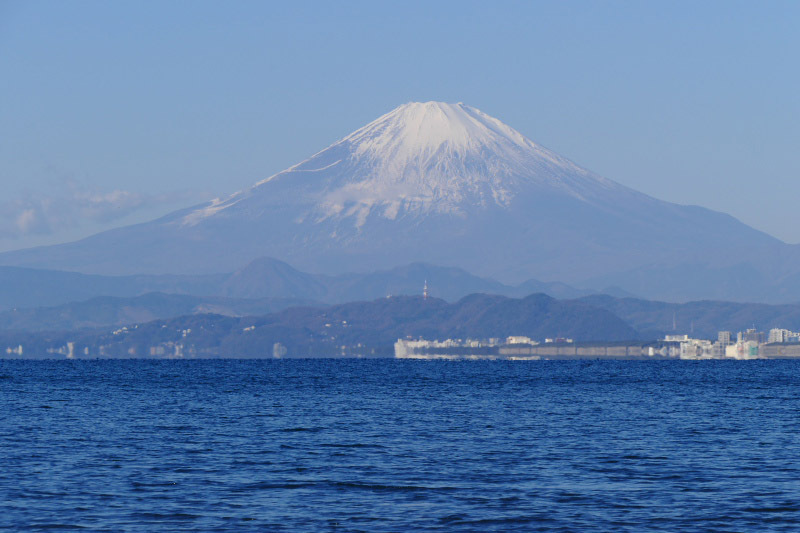 Enoshima Island and Kamakura is well-known place to see this beautiful and "The symbolic and representing mountain of Japan"- Mount Fuji since old days and it was drawn on the Ukiyo-e print of the Edo era. 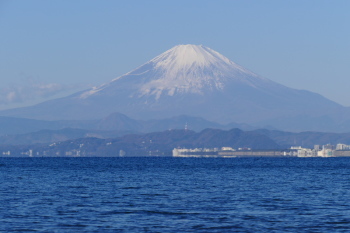 Especially on clear day in autumn and winter, we have many chance to see the mountain. Where is good to see? Please visit our Mount Fuji viewing spot page. 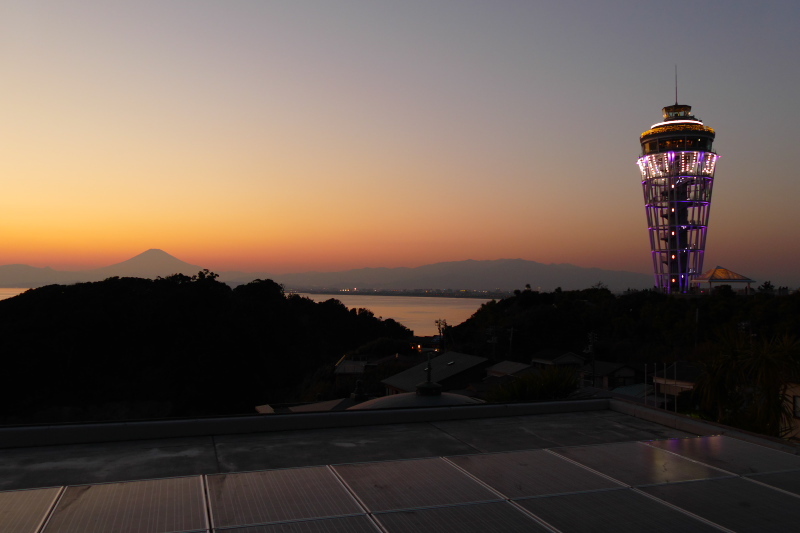 If you are in Enoshima and Kamakura in the afternoon, don't miss to see the fabulous sunset. 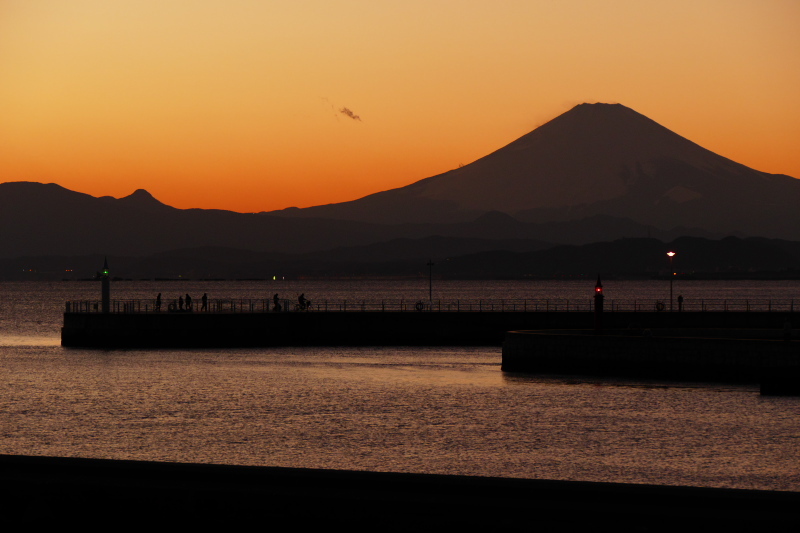 Often you can look majestic views of Mount Fuji also. Our recommended places guide to see the sunset and sunrise on our site. Please see Sunset and Sunrise viewing spot page in detail. 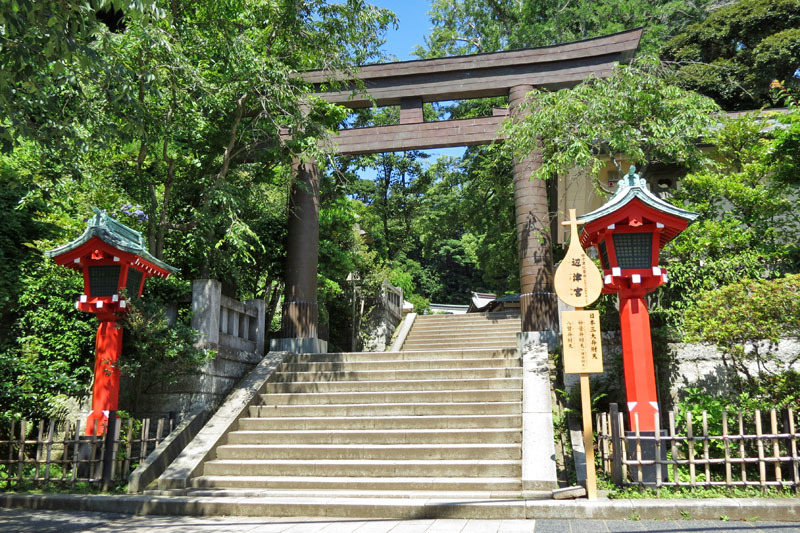 By the way, can you distinguish a temple and a shrine? In Japan, there are the times when Buddhism and Shinto mixed in old days. So, it is hard to distinguish them in some cases. We'll tell you some points of how to distinguish them. 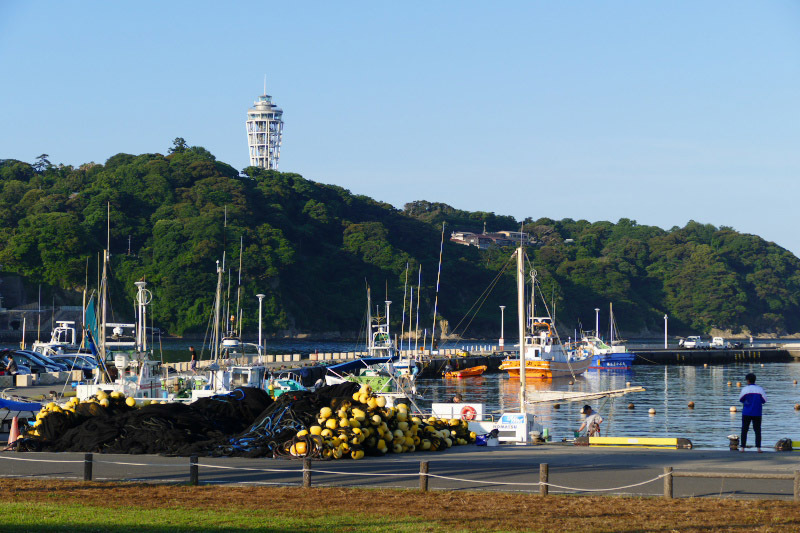 Sea of around Enoshima Island and Kamakura is a good and rich fisheries. So, you can taste very fresh seafoods that was caught in the morning for lunch! Especially well known for whitebait and shells. These seafoods are offered by various cooking method. sashimi(raw fish), baked, fried, Tempura, Donburi(rice covered with raw seafood or cooked seafood together with egg). Not only Japanese style dishes but also pizza, pasta ... snacks and sweets are available. These restaurants, cafes and shops are mostly located in following area. 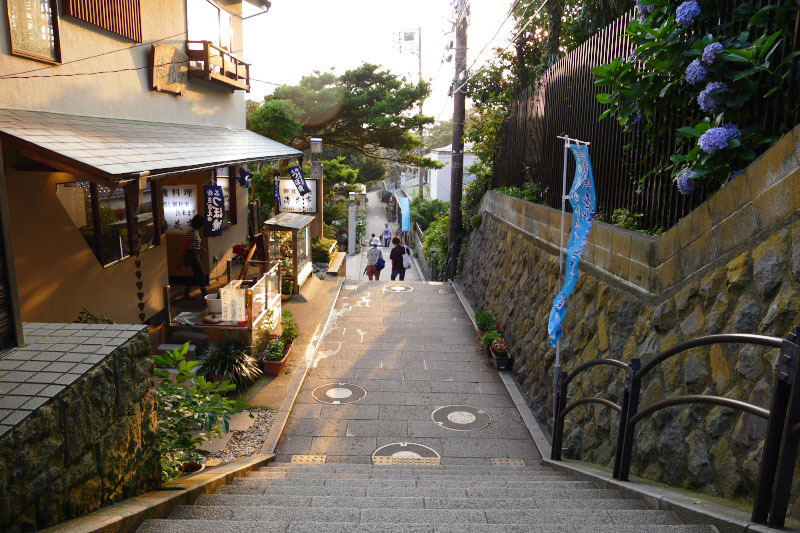 Almost all tourist spots inside of Enoshima Island are located in mountain or mountainside. These spots are connected by many many steep stairs and long long slopes. It's like to go hiking. We often see person who can blister on her/his foot. Furthermore, there is very limited transportation here (paid escalator, one-way for upward only). You have to walk narrow and long steep stairs or slope to go to anywhere. We understand you want to show your nice shoes during the travel, but we strongly recommend you to wear such an nice shoes when you go to Ginza, and wear flat sports shoes when you come here. And please watch your step carefully to avoid falling down or injured. 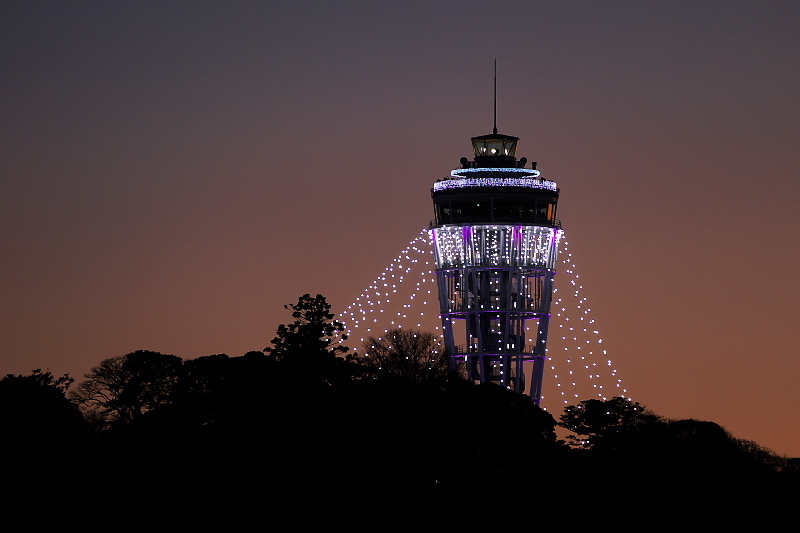 If you visit Enoshima Island on sky-clear day, why don't you climb the top of "Sea Candle" that is on top of the island. From the observation terrace that has 101.5meters height above the sea level, you can enjoy superb 360 degree panoramic view of Southern Kanto region including buildings in Yokohama city and Mt. Fuji. Evening and night view also highly recommended. To see more detail info, please visit our Sea Candle & Top of the island area guide page. 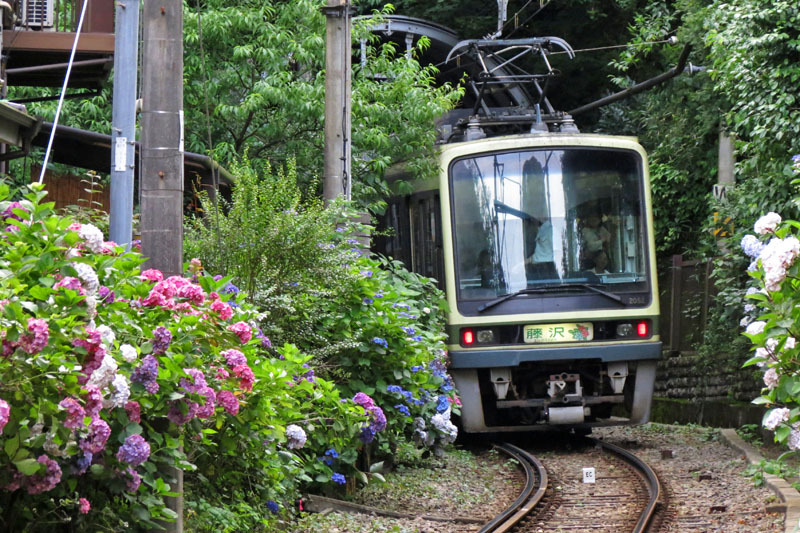 Enoden train is not only a transport but also one of the highlighted attraction in Enoshima and Kamakura area. It runs more than 100years between Kamakura and Fujisawa. You will enjoy variegated scenery from the train, such as magnificent widespread seaview or convoluted backyard of houses. One of it's nostalgic train "Type 300" is must ride! It's a oldest train and well-known for as a symbol of the area. More info available on our Enoden Line guide page. 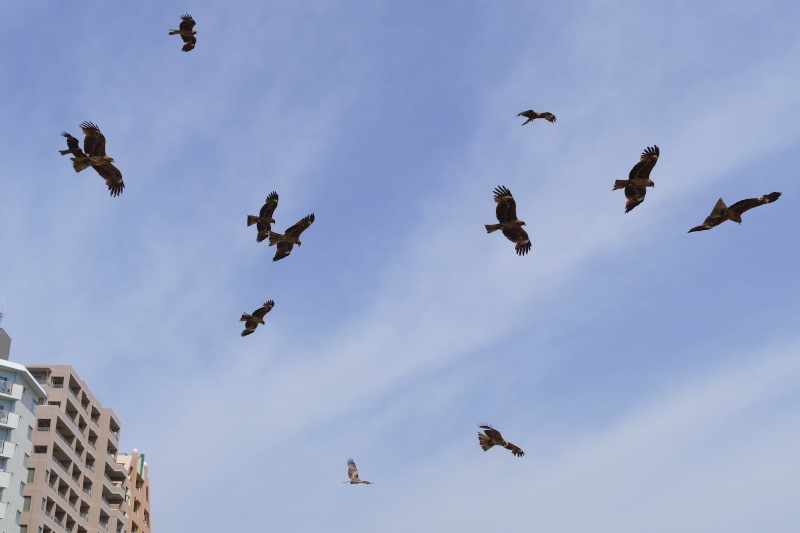 When you are in the seaside of Enoshima Island or Kamakura, you will see black kites(falcon) fly lower near your head. They watches and aims to steal your food from the sky. Sometimes not only stolen the food, some people get unexpected injury by a sharp beak and nails. Recently, the harm by the black kite occurs in Komachi-dori street, a famous shopping spot in the center of Kamakura too. We strongly recommend you have to eat or drink something at the places under the roof. 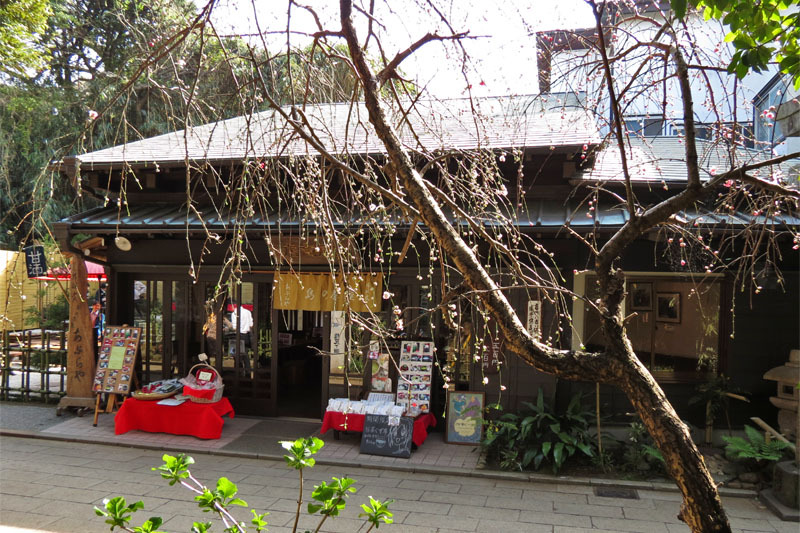 Some cafes or sweets shops in Enoshima and Kamakura are using old traditional wooden Japanese style houses. It will surely satisfy your interest to our culture. Ofcourse, you can taste Japanese sweets at these cafe or sweets shops, and also able to feel real tradition of Japan!! 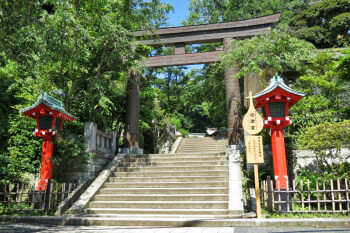 Some of them are located in Oiwayamichi way and near Okutsunomiya Shrine in Enoshima. 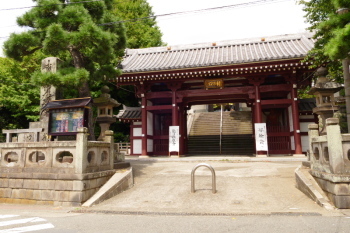 And also some of them are located in Hase and Kamakura. 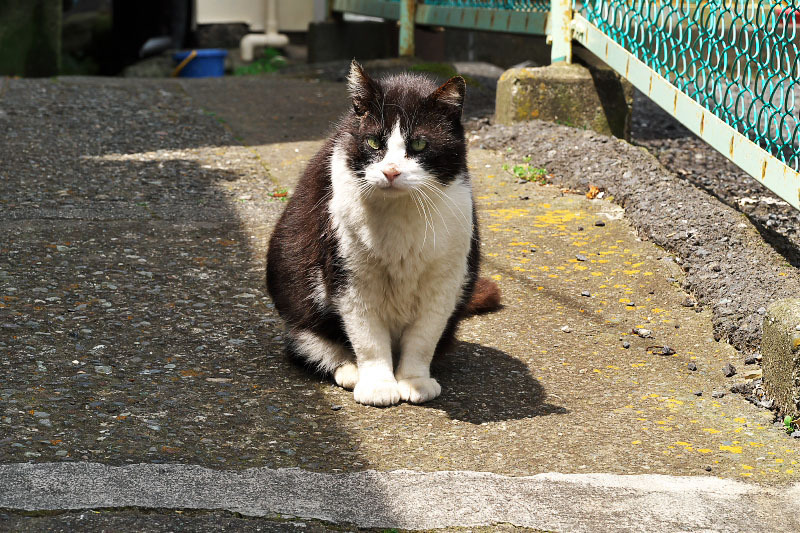 You will see the cats while walking in Enoshima Island. Many of them are street cats. These cats are well accustomed to people and we can see their life very closely. Not a few people expects to come here and see their cute action recently. We shows some cats photo that met in the alley. Please see Animal page. There are less trash can in Enoshima Island because of hard to access by waste collection vehicle. If you leave your trash, it will not only make dirty the place, but also might be blown away to the sea. That means make dirty the fishery and may become less seafood. Very recent days, suddenly a lot of "Pokemon Go" users surge to the island regardless day and night, and they left a large quantity of garbage. This is causing severe problem and followed that entrance regulation was enforced at night time. 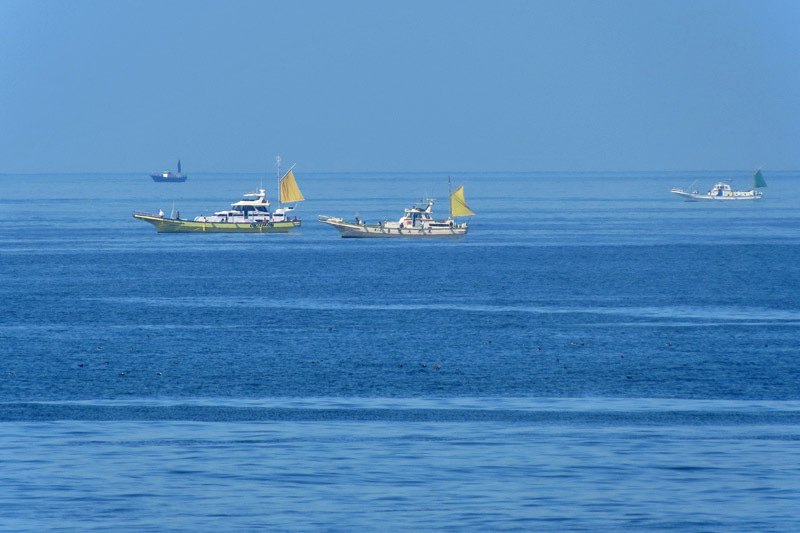 Often local resident collects trash to keep clean the area and sea. So, you also don't leave your trash please. Your understanding and cooperation is highly appreciated. 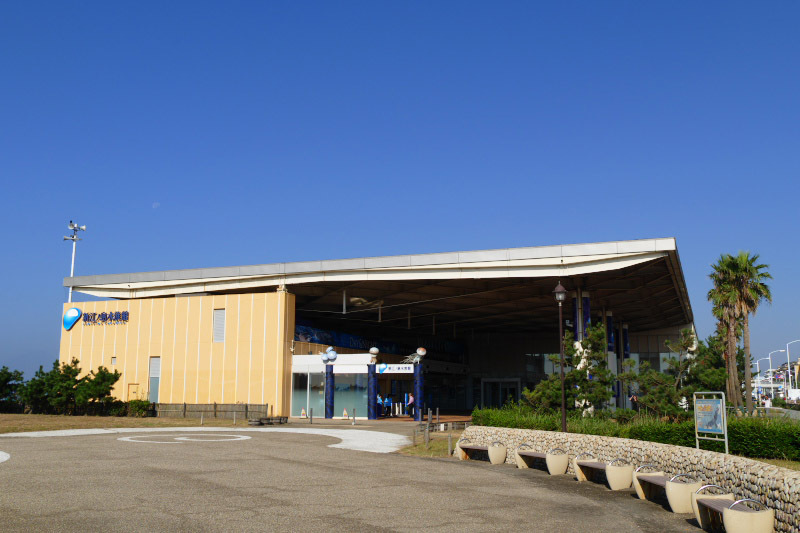 Enoshima Aquarium ("Shin Enoshima Suizokukan" in Japanese) is in the seaside of Katase Nishihama Beach. It is truly beautiful and worth to see well-known one of the world's extensive jellyfish exhibition. See more detail at official site. Dragon is important existence for culture of Enoshima Island and around. There is a old tale that a five-headed dragon lived in and married with an goddess. Finally, the dragon transformed to a mountain behind of Ryukoji Temple to protect local inhabitants. 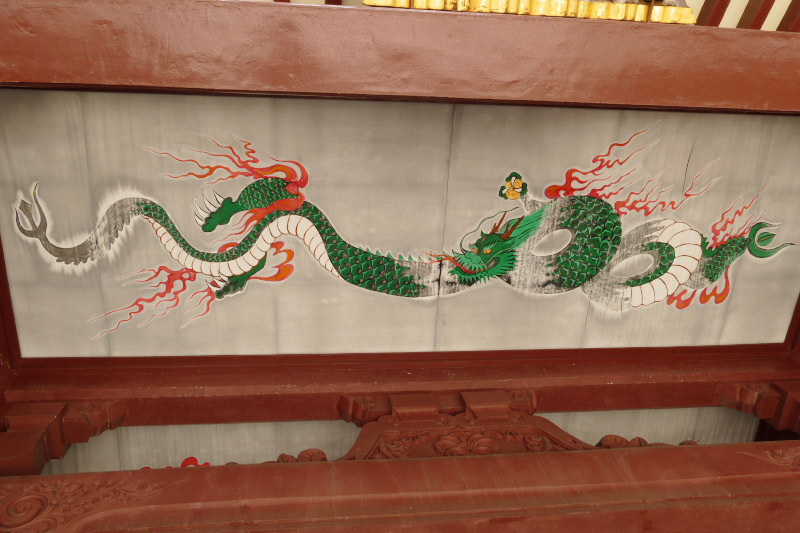 Therefore the dragon is enshrined in both temples and shrines regardless of difference in religion and many objects exist in the area. How many can you find? 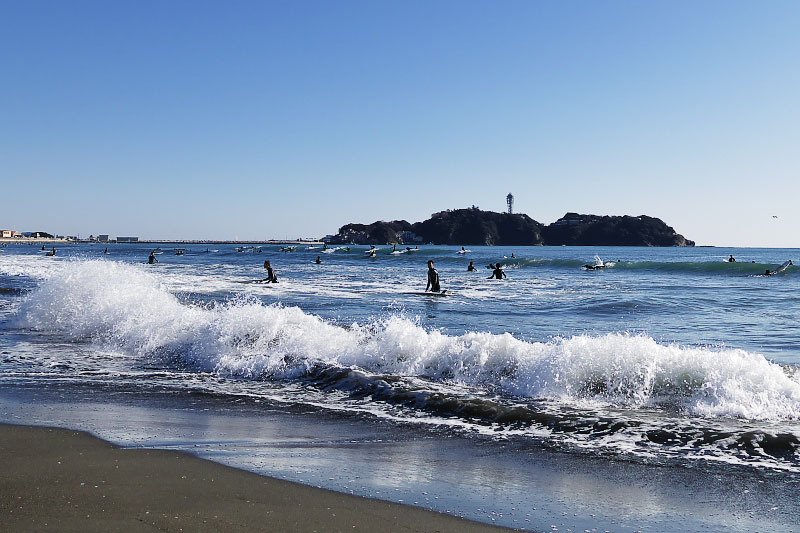 Enoshima Island is surrounded by a three directions to the sea and blows wind frequently through the year. Sometimes, the wind is especially blow strongly at the seaside. Be careful not to blown away your belongings! 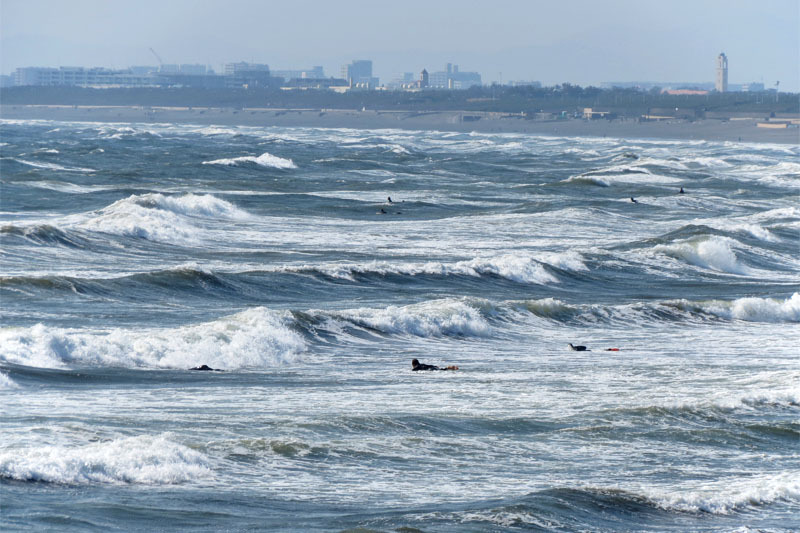 Because of the splashed waves that was blown by a strong wind, you may get wet when you are on Enoshima Bentenbashi Bridge. Anyway, please pay attention when you are here on windy day.